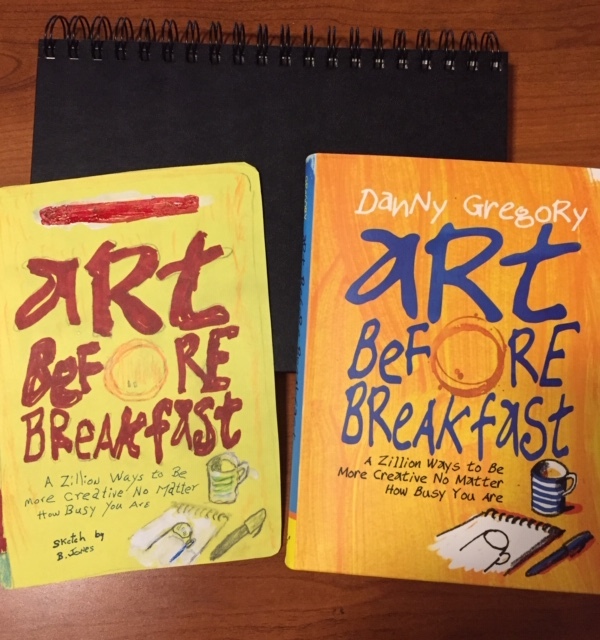 Danny Gregory’s book, “Art Before Breakfast” spoke to my creative side. I completed my first art approach as shown here on the left, but having thought about this I am tempted to switch it to the right, since if you tend to be more creative or artistic, you're thought to be right-brained. The book certainly appeals to the right brain. 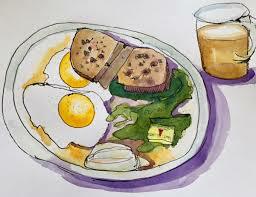 Making art will make you saner and happier. You don’t need to think you have “talent” to make beautiful art. Art making can fit into the craziest, busiest, most hectic and out-of-control lives-even yours. One of my own first attempts to take Danny’s advice was to just find what was in front of me and draw it using his guidelines and one of his suggested approaches. By the way it was after breakfast that I did this. I was kind of proud of myself for thinking of using white out to make the white areas white on the yellow paper. A book that will get you to try something out stands out as worthwhile and a good read. Try it out. I had to chuckle a little when I read somewhere in the first part of the book Danny say “you ought to buy a copy for everyone you know.” Go ahead do it.